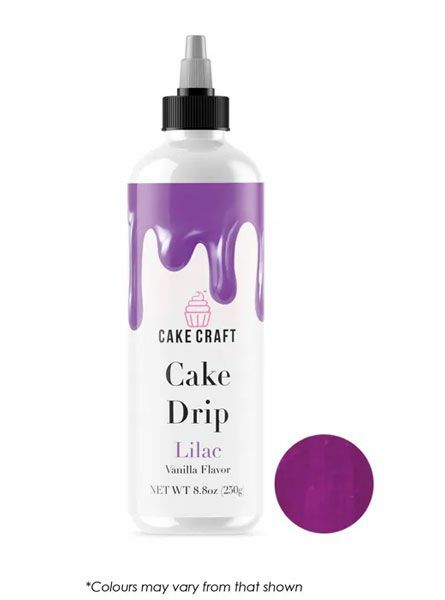 Drip cakes are cake decoratings biggest trend! A simple and effective way to add brilliance to any cake. Creating consistent chocolate drips is now even easier with Chocolate Drip. Each bottle is microwave safe and the squeeze top is perfect for creating accurate drip effects. Method: Microwave for 30 seconds without lid. After heated, secure lid and shake thoroughly for 1 minute to ensure chocolate has melted through. If chocolate hasn't completely melted through, heat in 10 second intervals until desired consistency is achieved. Cut tip and proceed to use. Ingredients: Sugar, Vegetable Fats & Oils, (emulsifiers 322 soy, 492 soy lecithin),Whey Powder, Flavour, Antioxidant (307, 307b), Milk Solids,Cream Powder, Natural Flavours. FDA approved Colours (differs per colour). Halal.